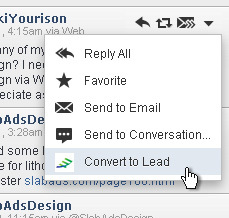 From HootSuite, easily create new leads from any incoming Twitter or Facebook post. Specify lead warmth, and other details directly from within the HootSuite dashboard, before automatically saving the lead to Simple Sales Tracking. Capturing Leads via social mentions is an effective way to generate new business. To learn more, read about the best way to increase your sales using Twitter. One way we’re committed to growing Simple Sales Tracking is through integrations just like this one with HootSuite. Have an idea for another integration? Tell us about it. If you’re already a HootSuite user, easily install the app plugin now. If you’re not, consider signing up for HootSuite today. It’s easy and you can get started for free straight away.